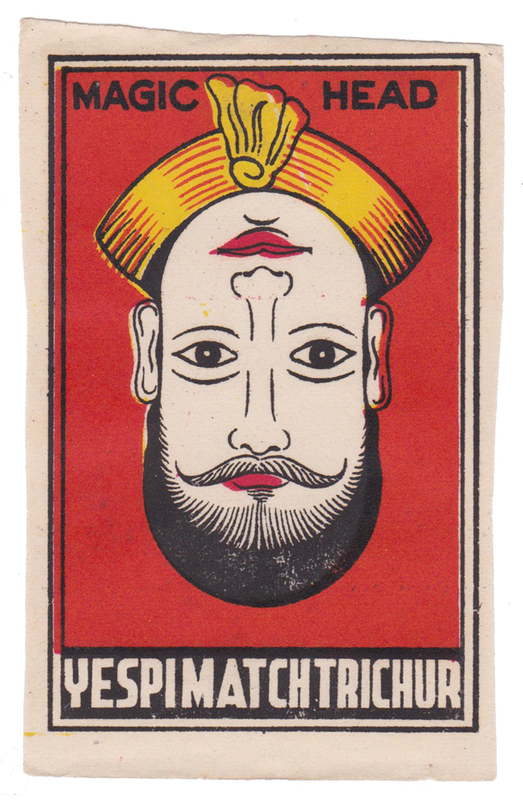 Early Indian matchboxes carried beautifully designed labels showing images of Hindu deities and legendary scenes; over time they took on a multitude of themes, ranging from the mundane (keys, lamps, fruit, farm animals) to the exotic (lotus flowers, glamorous beauties, fighting tigers and elephants) and the comical (a pair of monkeys smoking cigarettes, a baby with a moustache, and a portrait than can be read upside down or right side up). In the 1970s, the Indian state introduced a scheme to reduce unemployment by allowing small businesses to claim state support; numerous new producers of matches emerged, a large number of them being subsidiaries of better-known companies. As a result, countless new labels were produced, many based on existing classic designs with slight and occasionally very bizarre alterations to the text or imagery. Nowadays there are obsessive collectors of the ephemeral vernacular images that are the subject of this small exhibition, all of them drawn to the bewildering variety of subjects as well as their humour and charm.